Stadium naming rights partner, AESSEAL, has agreed to extend its deal with Rotherham United until May 2023. With global headquarters at Templeborough, AESSEAL manufactures seals to stop leakage of harmful liquids and gases into the environment for a wide range of industries, including oil and gas, food, water, mining and pharmaceuticals. The company also has a branch office on the Barbot Hall Industrial Estate, next to another Rotherham manufacturing success story - ASD Lighting - the firm built up by Tony Stewart. 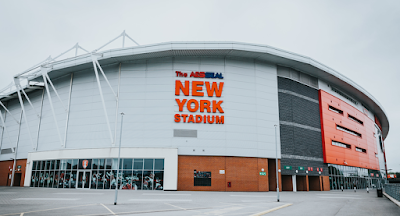 Beginning in 2014, the deal with the club's first ever stadium naming rights partner saw the state-of-the-art £20m home renamed The AESSEAL New York Stadium. The extended partnership will see the AESSEAL logo remain on the Millers' home for a further five years. The latest announcement is part of a string of renewals, as more long standing and new partners commit to a future partnership with the League One club. 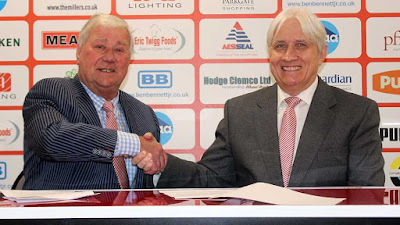 Tony Stewart, chairman of Rotherham United (pictured, left), said: "We're very grateful that such a large and respected company are again on board with us moving forward, and we're very pleased that we'll have the chance to build on our excellent working relationship with AESSEAL over the next five years. "I am delighted to continue our association with Chris Rea, who is someone I have known for many years and someone who has the similar drive, passion and ambition that we share here at Rotherham United. "Chris and I go back many, many years. Years have passed and that relationship has grown and grown and it's great to see that his reputation both locally and globally has continued to expand. "We have shared beliefs in our passion for the football club, the community and the people of Rotherham. "We are very proud of our stadium, so it was imperative that we found a company whose reputation we knew would be befitting of this fantastic venue. AESSEAL were the only choice, and we are delighted that they will remain part of our journey for many years to come. "They've got behind what we're doing here at the football club and we're very grateful for what has been fantastic support from the day that I took over here." Chris Rea, group managing director and founder of AESSEAL (pictured, right), added: "Nothing has changed in terms of our passion for supporting Rotherham United, it is the same now as it was in 2014. "We have seen first-hand how the club is run by Tony Stewart and the senior management team, and we are very proud for our brand to be strongly associated with Rotherham United. "We have enjoyed a productive and healthy relationship with the chairman for many years, and I am proud that as a company who are based in the town, we can put something back into the football club and community of Rotherham. "The stadium itself, is one of the finest in the region and it is something that the people of Rotherham can be really proud of. AESSEAL are certainly proud to have our name on one of the most distinctive and iconic venues in the town." Recent deals at the club include extended partnerships with Parkgate Shopping and Guardian Electrical Compliance. Steve Coakley, commercial director at Rotherham United, said: "I would like to echo the chairman's sentiments in saying that it has been a pleasure to work with Chris and the team at AESSEAL since they came on board in 2014. "As a result of their naming rights partnership their branding has become a part of our corporate image and we're very proud to carry the AESSEAL name at our base here at the stadium. "Our extension with AESSEAL marks another landmark commercial deal for the club, after we recently announced that long-term sponsors Parkgate Shopping will continue to work with us going forward and I speak on behalf of everyone at Rotherham United when I say that we are looking forward to many more successful years of working together."